What are Azure functions? Example of Invoking Azure functions inside the Logic App. In General, functions are used to run the small pieces of code to make it reusable. Similarly, Azure functions are used to run the small pieces of code inside Azure platform. You can create the functions either in Azure portal (using function App) or in visual studio. Azure functions are serverless computing service hosted inside azure cloud. Serverless gives the capability to user to write the code and run it with any trigger or event. Azure functions are not complete, fully featured applications instead they handle specific, short lived tasks. Azure functions supports functions developed in C#, F#, php, python and many other. Azure functions also support Nuget open source package manager and many other libraries, continuous development, deploy code through Git, and also provides security through OAuth systems etc. 1. Quick development and deployment of small components to Azure functions. 2. Directly code your functions right from your Azure Management Portal. Target here is, Whenever a new Contact will be created at the Salesforce end, GetName function from the Azure function app will be executed and we will insert the Contact record in the Azure SQL table Contact, in other words returned response as a string Name from function will get inserted in the firstName field of table if the status code is 200. 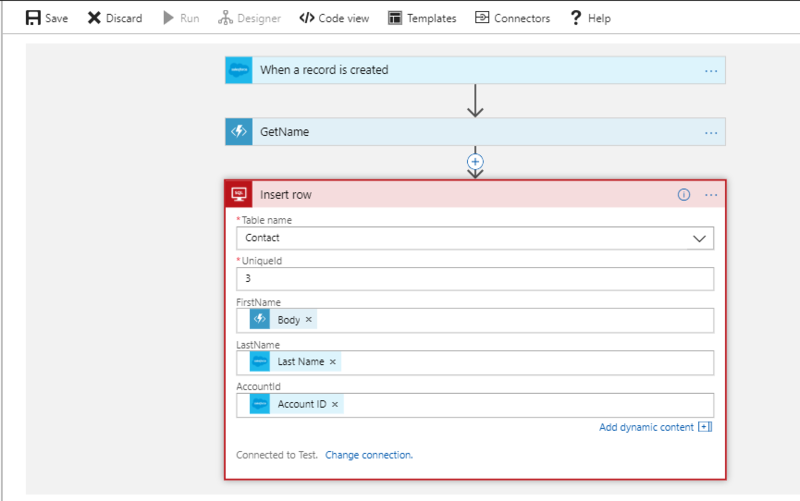 First, Create a function App in Azure Portal (let’s say FunAppDemo). After creating the function app, It will open the following screen. Select the function type i.e. which type of trigger will run this function. I have selected the Http trigger for this example. Click on http trigger and add the appropriate details (desired language, your trigger name, desired authorization level) as shown in following screenshot. Click on the create button and it will create the following function in which we are accepting a name parameter in the http request url and this function is returning the value of that name parameter in the response with ok status if name is not null otherwise returning the response as a ‘Bad Request’ along with a message asking for passing a value in the name parameter. Now, save the logic App and click on the Run button. Now, check the logic App designer and see if your logic app ran successfully. Now, check the SQL db table whether record data is inserted properly or not. This example is very simple and for demo purpose only. You can create as complex functions as required and can be called by any other azure service like Azure Event Hub, generic webhook, logic apps etc.